It is interesting to compare what millennials are looking for in their workplace and what tech start-ups are aiming to achieve in the property market. Global Tech firms are recruiting top talent, directly competing with big banks, consultancies and other global players in traditional industries. Firms like Google, Amazon and Facebook have all recognised the importance of the built environment for attracting young, motivated employees who want to work in tech-enabled settings. Those companies that neglect the importance of embracing new technological trends will become stagnant and ultimately constrain growth. In fact, a recent workforce study from Penn Schoen Berland confirmed the importance of smart offices to the millennial generation, with 82 per cent of 18-34 year-olds stating that a tech-enabled office would influence their decision to take a new job. The real estate technology sector is not only at the forefront of efforts to create offices that appeal to millennials. The sector itself is attracting a new generation of start-up founders who are eager to harness technology to ‘disrupt’ the current property market. It is interesting to compare what millennials are looking for in their workplace and what tech start-ups are aiming to achieve in the property market, particularly when it comes to remote working trends and developing ideas. In the UK, 15 per cent of employees work from home. 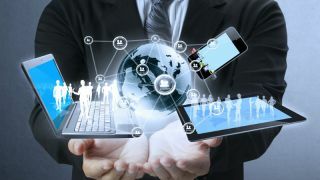 As such, it comes as no surprise that the Penn Schoen Berland study found that 73 per cent of millennials stated that advanced technology in their workplace is important because it allows remote collaboration with colleagues. In a similar way, tech start-ups are working to enable remote collaboration in the property market to support seamless transactions. Transactions in the real estate industry are characterised by agreements involving multiple different parties (buyer, seller, land registry, lawyers, utilities, banks, etc.). There is vast potential for digital platforms to enable collaboration by allowing these parties to access and store documents, find key information and track progress. At Goldacre, we are particularly excited by Blockchain as a tool for digital transaction platforms. Blockchain allows for decentralised systems and information that can be accessed by different parties, whilst maintaining high levels of transparency and security. Blockchain platforms could radically reduce the need for lawyers throughout the entire process of transacting property. It is also important to note the interesting correlation between the concept of remote working and the spread of millennial talent away from the capital. According to The Guardian, 93,300 people moved out of London last year, representing a five-year peak. Crippling property prices, noise and air pollution, rising rates of violent crime, stressful commutes and the sheer cost of maintaining a desired standard of living in London have all disproportionately affected millennials. More than ever, millennials are being drawn by more affordable satellite locations, such as Milton Keynes, St Albans, Dartford and Cambridge. Remote communication has never been easier, with video calling at our fingertips. This, coupled with the spread of WiFi connectivity has made remote working possible from anywhere in the country at any point. It therefore comes as no surprise that we have seen a rise in the number of millennials moving out of the capital and keeping their jobs. Multinational companies have successfully identified these developments. PwC recently announced its plans to ditch landlines for mobile phones in a wholesale efficiency drive. In line with the surging popularity of remote working, this move very much reflects the global shift towards portable communication and universal connectivity. These changes are not just about cost-savings, organisations with the infrastructure to support remote working are able to attract and retain young talent who value flexibility, not being stuck in an office for a set number of hours. 67 per cent of millennials stated that virtual/augmented reality equipment is a useful asset for product development. In the property sector, we have already seen the impact of VR applications. In property construction, VR tools are commonly used to create sophisticated mock-ups, eliminating the need for the expensive process of making physical models. Estate agents are able to offer virtual tours of properties, ultimately reducing costs and making property viewing more accessible. At the same time, multiple prospective buyers are able to tour the same property simultaneously to the real benefit of the agent. It is clear that we have only just tapped into the potential of this technology. We predict a wealth of applications in the retail space with VR/AR being used to combine the best of online and physical shopping experiences for consumers. In spite of the increasing demand for smart offices and the real and potential benefits of technology to enhance the wider property sector, it is important that technological innovation is assessed in a pragmatic way. Technology is a tool and a tool is only valuable if it makes a task easier or more enjoyable. Augmented reality is one way of testing out a product, but in the property market, the best way of testing a tech innovation remains good, old-fashioned exposure to the market. As more and more tech entrepreneurs and start-ups look to enter the real estate space, gaining access to the market to prove the material value of their innovations is the biggest obstacle. That is why we launched RElab, an accelerator for start-ups and early stage tech businesses with a real vision for innovation in the property market. RElab is not a virtual programme. It is an opportunity for founders and start-ups to prove their value proposition in a real, live testing environment and to get direct feedback from customers, investors and sector experts. Tech innovation is already changing the property market and we want to uncover the next generation of innovation in the best possible way – getting new tech into the market. This is not only an exciting time for businesses looking to use technology to disrupt markets, but also investors looking for the innovative start-ups with the potential to scale up. The search for the first real estate tech unicorn is well underway and we have only witnessed the first wave of innovation.